Michael Rooker is an American actor. 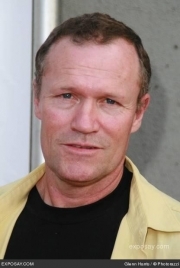 Rooker, who has eight brothers and sisters, was born in Jasper, Alabama and studied at the Goodman School of Drama in Chicago, where he moved with his father and siblings at the age of thirteen, after his parents divorced. In 2010, he starred in James Felix McKenney's horror film Hypothermia, which was co-produced by Larry Fessenden and set in New York. In June 2010 he revealed via Twitter that he was to appear in the AMC television series The Walking Dead. In the series, he portrays Merle Dixon, one of the survivors of a zombie apocalypse. Whole or part of the information contained in this card come from the Wikipedia article "Michael Rooker", licensed under CC-BY-SA full list of contributors here.